Engine hours are calculated at metered indication (currently 2,719) plus 2,000 hours based on a previous replacement of the meter. 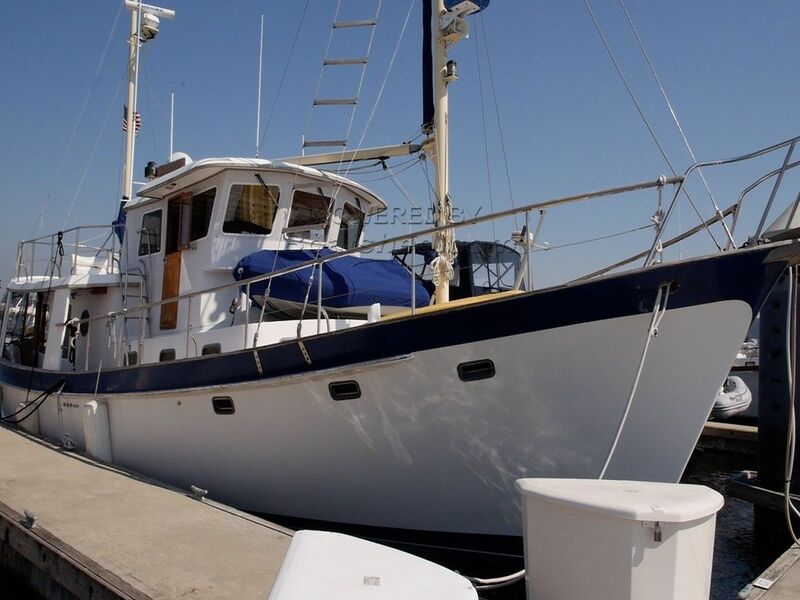 This long range cruising trawler is rigged as a ketch to provide for steadying the vessel underway, sail assist to conserve fuel under power, and for emergency propulsion. The forward mast is rigged with a crows nest to provide for manning a lookout aloft. Mainsail with external roller furling system at mast; internal halyards at forward mast; teak ladder steps mounted in the starboard rigging for going aloft to the crows nest; sail cover for mizzen; protective fabric on the luff covers the mainsail when furled. This is a heavily built full displacement long range cruising trawler designed to cross oceans. condensation build up inside the hull. The vessel features an exceptionally well designed layout to ensure comfort and safety on long distance voyages. Enter the boat from a folding platform on the aft starboard quarter. The cabin design features a covered outside walkway on the starboard side, and a flush cabin on the port side to maximize interior space. The curved aft deck is covered and fully enclosed with new canvas and an opening teak door to the starboard walkway. Double teak doors open to the main saloon. This space is fully open without built-in settees or upholstery. This permits each owner to customize the cabin to suit the owner's needs. The port side has a series of ventilated teak cabinets built in. A teak drop leaf table and two wicker chairs are in place here. At the forward end of the saloon is an L-shaped counter with a bookcase, lockers, and the electrical panel. On the forward starboard side the galley features a large pass-through with counter which is ideal for entertaining a group aboard. The large galley has more than ample counter space for food preparation. A Force 10 propane stove with oven is installed, along with twin Sub-Zero built-in refrigerators (one in the galley, one in the forward passageway). A very large cold plate freezer is in the corner of the counter (this requires a new compressor unit to function) which can also be used as an icebox. The flooring throughout the boat is teak parquet. The floor in the main saloon has three large removable hatches for access to the engine room. An additional hatch near the galley provides convenient access for engine checks. By removing the three hatches, the engine can be lifted and removed from the vessel through the aft doors. Forward from the saloon are stairs to the pilothouse or the lower cabin. The pilothouse features split opening doors to port and starboard. The starboard door allows access to the forward deck, upper deck, and the walkway. The port side door permits access to the forward and upper decks. The pilothouse features a long settee that can form a pilot berth. The helm features a white leatherette pedestal chair. The layout of the pilothouse is ideal for practical navigation and features forward facing windows and windows all around for great visibility. Outside, stairs aft lead to the large upper deck. Here a small flybridge helm station is in place with a new canvas cover. This station includes full navigation displays and engine instrumentation. The mizzen mast is aft, and the sheeting for the mainsail is forward of this station. An opening hatch aft on this deck leads to the aft cockpit area. Back inside the saloon, stairs to port lead to the forward cabins. The passageway cabin space can be set up as an office, with upper and lower single berths in this space. Large hanging lockers are in the passageway. The master suite is very large with a walk-around queen berth, ample storage in lockers and teak cabinets, and a private head compartment with shower. Opening ports to starboard provide ventilation and light, and thoughtful prism light devices are in the ceiling in all of the cabins. Forward of the office area is the guest head compartment with shower, This has a large molded seat and is ideal for use underway. All the way forward is a large guest stateroom with offset double berth, expansive width, and ample storage. A seat and vanity cabinet are built in. All new canvas for cockpit enclosure, flybridge helm cover, bimini, and sail covers. This boat is fully equipped with current navigation and communication equipment for safety at sea. All navigation equipment is integrated through a NMEA 2000 network. VIRTUAL TOUR - VIDEO - 80 TO 100 PHOTOS - FULL SPECS CAN BE VIEWED OF THIS KADEY KROGEN 54! Only eight of these outstanding boats were built. Ours is the last and newest of the fleet. The Kadey-Krogen 54 Pilothouse Trawler was branded with the phrase "no port too far" when the design was introduced in 1987. Building on the success of the smaller boats in the line, the Krogen 54 is a three stateroom model aligned with the principles of passagemaking pioneered by Robert Beebe. A single, naturally aspirated, reliable Caterpillar 210 HP engine drives the boat. Parts and mechanics who know the engine are found all over the world. A ketch sailing rig provides for stability and safety underway offering backup propulsion in an emergency. There's even a crows nest lookout platform. The boat has ample tankage for fuel, water, and waste, and includes a 600 gallon-per-day watermaker. The boat is economical, too, burning less than 2 gallons per hour to achieve a range of 3,500 nautical miles. Inside, the boat is elegant, with an open teak saloon, large galley with serving counter space, a midship master stateroom, forward private cabin, and a desk area with berthing serving as a third cabin. The pilothouse is equipped with a complete, integrated suite of navigation electronics including a SSB radio and AIS transponder. You just couldn't do better if you are looking for an elegant, prestigious, value priced liveaboard boat that can take you safely, economically, and comfortably to nearby cruising destinations or distant shores. This Kadey Krogen 54 Pilothouse Trawler has been personally photographed and viewed by Brian Moratti of Boatshed Port Townsend. Click here for contact details.